Power consumption was measured at the socket using a plug-in mains power and energy monitor. 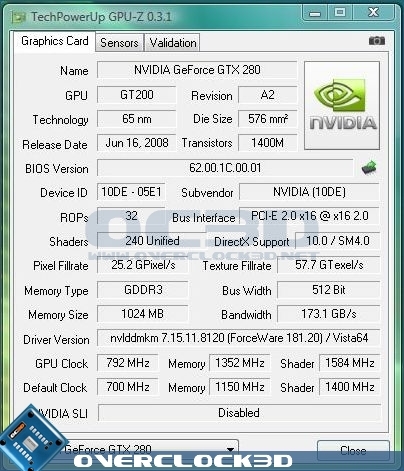 Because of this the readings below are of the total system, not just the GPU. Idle readings were taken after 5 minutes in Windows. Load readings were taken during a run of Crysis. For the power consumption test I added the additional power draw of the Laing DDC pump + 3 yate loon 120mm fans which were used to cool the radiator. This is in place of the stock aircooler on a standard GTX280 so it comes as no surprise that the watercooled card did, all things considered, draw more power from the socket than a stock GTX280 due to the additional equipment required. Wow. The performance of the waterblock is certainly under question no more. Cooling the card down to such a level demands respect and even when the card was overclocked (see below), the card reported very little increase in temps, maxing out at an astonishing 48c after 5 minutes of Furmark. This is far beyond the conservative drop pf 10c claimed by MSI. At the time of the review, we couldn't test the restriction by any scientific means other than by sight of cavitation in the reservoir which surprisingly seemed unaffected by the GPU block as much as I would have thought. For our overclocking tests I used Rivatuner to overclock the card which is perhaps the most commonly used generic utility to overclock GPU's at a driver level. To test stability, I ran 3D Mark 06 and a few runs of Crysisbench which I confess does not signify true 24/7 stability, however, it does give a good indication of stability nonetheless as heat would be the main enemy. As you can see above, this is not the case with this graphics card. 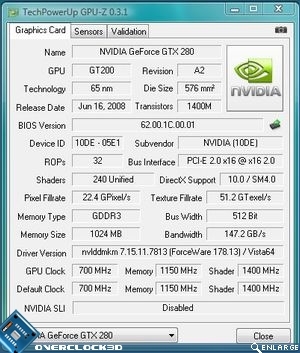 As the card was already overclocked past the GTX280 stock clockspeed of 602MHz to a record 700mhz, we did not expect the card to perform much higher than this given that most GTX280's that have passed through our hands reaching a maximum 730mhz. We were wrong. The Overclocking performance of the MSI nGTX OC Hydrogen far exceeded our expectations reaching a maximum 792Mhz on the core before instability materialised. This I feel was a limitation of voltage rather than temperature and I have no doubts that given a few volt mods, the card could easily exceed 800mhz. We left the shaders linked to the corespeed which also reached an astonishing 1584Mhz. 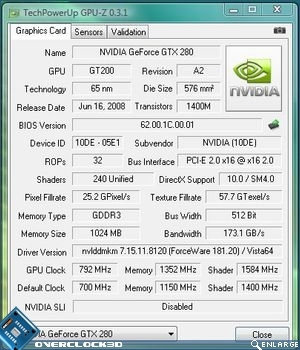 Couple this with a memory overclock of a further 200mhz past the 1150mhz overclock as standard, and this is by far the fastest GTX we have ever come across. Simply amazing.